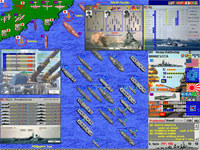 Naval strategy battleship game which covers all major navy battles during ww2. Game contains missions, death-match and free hunt scenarios & campaign from pearl harbor and midway to the iwo jima and leyte battle. Player can control or fight against usn, kriegsmarine, imperial japan navy, royal navy, royal canadian navy, royal australian navy, royal new zealand navy and regia marina (italian navy) scenarios include aircraft carrier game, submarine games, bismarck, atlantic 1941, lamansh, raaf, doenitz, coral sea, midway, hms prince of wales, leyte, us marines, atlantic 1943, sir john tovey, normandy, invasion, emperor hirohito, hmas perth, road to okinawa, singapore, iwo jima, kamikaze, conquer of italy, norway convoy, u-boats, fall of australia, battle for leyte, conquer of japan, yamato, spruance, halsey and many others. All unit names and officer ranks are historic. Player can purchase new ships/planes during the game. There are more then 50 unit types, including battleship, battlecruiser, fleet aircraft carrier, heavy anti-sub cruiser, heavy bomber, long range fighter, long range naval bomber, fleet cruiser, heavy fleet destroyer, fast carrier and heavy fleet submarine type. Game objectives: conquer enemy ports, defend friendly ports, destroy ships, eliminate all enemy units, secure transport convoy to the friendly port. 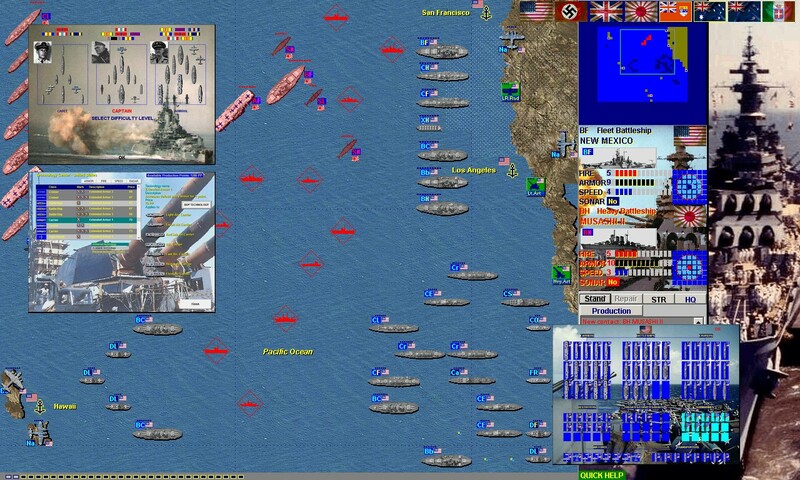 Battleships And Carriers - World War 2 is a game that works under windows xp, windows vista and windows 7. It supports both 32-bit & 64-bit windows editions, therefore it could run faster on 64-bit computers. It is Free so you can download it and share it with your friends. Estimated download time for Battleships And Carriers - World War 2 on a common adsl connection is less than a minute. Version 1.83 was released two hundred thirty one days ago by SLS Strategy Lights Systems. Click the green download button to download it now.